Things were pretty crazy through December, what with my earlier than usual Christmas party, the anticipation of the arrival of my newest niece, and then of course, heading home for Christmas. So, I never did get around to blogging the end of the Fall Into Reading challenge. When we were little girls, my dad would wash our hair in the kitchen sink for a special treat. He has started doing the same with Emily sometimes when he is the one bathing her.....I managed to capture some of the fun! I'm not sure she is completely sold and able to relax and enjoy it while in the midst, but she keeps asking for him to do it again, so I guess she does like it! I made it in town on Tuesday just in time to visit at the hospital for a few minutes and capture the new addition leaving the hospital to head home. She found her thumb! It hasn't been constant yet, but I bet she will take after her big sister! 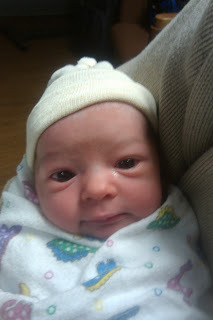 Anna Pearl - born 12/19/2010 at 8:40pm. She is 6 pounds, 3 ounces, 19 inches long. This pic looks so much like her big sister to me! Can't wait to get home and snuggle up with this cutie-pie! So, I spent Thanksgiving playing with my new camera....taking lots and lots of photos and a few videos as well. So, word of warning....there are lots of pics here. Getting tickled by aunt Jenni! Riding Trigger! He finally has made the move from Grandpa and Pearlie's house back to Emily's house (only 6 months after she got him for her birthday). Engrossed in Mickey Mouse Clubhouse on Disney. It's about the only show she will watch on TV - which is not entirely a bad thing. Doing the Hot Dog Dance!! Wish I had video of this one. Picking our her Toms shoes - we all got a pair courtesy of Grandpa - and so children on the other side of the world got new shoes too! Heather, Phillip & Emily went to be with his family on Thursday, so we celebrated on Friday. Emily had a sleepover Friday night and woke up Saturday to help Grandpa bake bread and make waffles. Yum! This is Emily telling me she is ready for me to stop taking pictures!! I've got a couple of fun videos as well....am going to try and post them in a separate post.